World War II ended on September 2, 1945 following the surrenders of Japan and Germany. 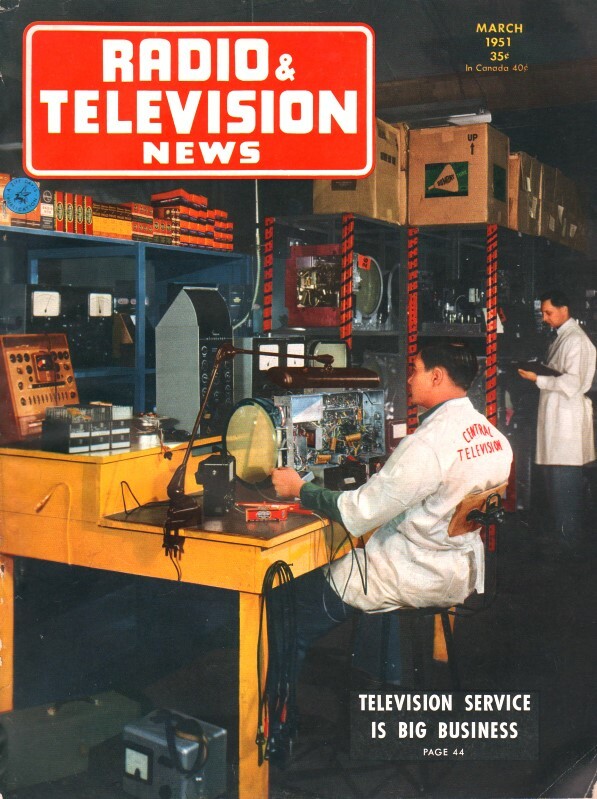 Almost immediately after WWII ended, the electronics market was flooded with vacuum tubes, resistors, inductors, antennas, transmission lines, meters, batteries, transformers, speakers, incandescent and neon bulbs, hookup wire, and even entire radios and test equipment. It was a good time for electronics manufacturers, hobbyists, and repair shops. In fact the U.S. government made a special effort to compensate the public for sacrifices made during the war. It didn't last long, however. The Korean War broke out on June 25, 1950, and ran through July 27, 1953. 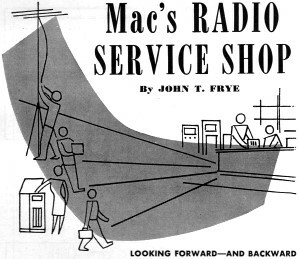 This episode of Mac's Radio Service Shop hints at the déjà vu of Mac's war years and the recurrence of leaner days settling in again. Not ten minutes before, a cloud of swirling snowflakes had been brushing against the front window of Mac's Radio Service Shop, but now the bright sun had suddenly popped through an opening in the ragged, wind-torn clouds and was melting the skift of snow that had scarcely had time to settle on the sidewalk. "Sure is a funny day," mused Barney, the apprentice technician. "Acts as though it can't decide whether to go forward into spring or backward into winter." "That's March for you," Mac grunted as he pulled a large cardboard box from beneath the bench and began stirring around in the contents with a probing forefinger. "Holy cow!" Barney exclaimed as he peered over Mac's shoulder. "Where did you get that bunch of tube adapters?" "You might say I have my pessimistic foresight to thank," Mac admitted rather sheepishly. "After the war was over and tubes were plentiful, when a set came in with a burned-out substitute tube in one of these adapters, I simply replaced it with the original tube and tossed the adapter into this box. It seemed rather senseless at the time, but now I am glad I did. With the tube situation getting tighter than a seersucker suit in a rainstorm, it looks as though adapters are going to be right in style again." "You think using an adapter is better than rewiring or replacing the socket to take a different tube?" "Depends. In rectifier and audio sockets, and in many of the r.f. and i.f. stages of broadcast receivers, I prefer adapters because they provide a quick, inexpensive, and just-as-good a method of tube substitution as going to the trouble of changing the socket. When it comes to changing the tubes in an FM or TV set, though, that is horse of another hue. In many stages of a television receiver, the few inches of extra wire added to the leads by the use of an adapter is sufficient to prevent the set from working at all; or, if it does work, to make a complete realignment necessary. In such cases, rewiring or replacing the socket to take the substitute tube is actually the best and easiest way of doing the job." "You don't need to do any re-aligning on an AM set after using a substitute tube in an adapter?" "I didn't say that. Usually a little touching up of the alignment is necessary, just as is often the case when you simply change from a metal to a glass tube of the same type; but this is a much simpler process than, say, completely re-aligning the stagger-tuned i.f. system of a TV set." "Is there anything else to watch when substituting tubes?" "You can bet your pointed little head there is! Just because the filament voltage and current is the same and the local broadcast station can be heard with the substitute tube in place is no sign the substitution job is complete. A good up-to-the minute tube manual, like this RCA Technical Series RC-16, should be the technician's bible when he starts juggling tubes. Every feature of the original tube and the contemplated substitute should be carefully compared. Plate impedance, grid bias, maximum grid swing - these and other ratings should be carefully considered and provision made for providing the substitute tube with the proper values when the switch is made." "It would be better yet if we could just make the tubes last longer, wouldn't it?" "We can make them last longer - after a fashion. For example we have been discarding noisy rectifiers like 35Z5's and 35Y4's. Now that these tubes are about as common as Stradivari violins, we shall place metal shields around such tubes and ground the shields to the chassis. In practically all cases this will completely stop the noise, and the rectifier can be used until it burns out. "And the life of the whole string of tubes in an ac.-d.c. set - and such sets are the tube-eaters - can be greatly lengthened by just inserting a 100 ohm, 10 watt resistor in series with the filament string. Most of the damage to the tubes is caused by the surge of heavy current that flows when the set is first turned on and the filaments are cold. At that time, the average total resistance of the filaments is about 100 ohms, which means that our 117 volts of line current can send more than an ampere through the filaments designed for only fifteen hundredths of an ampere. The strong magnetic fields that accompany this husky current make the little filament wires writhe like a fire hose when the pressure is first turned on, and that writhing is what breaks the filaments." "Looks to me like putting in a 100 ohm resistor would double the resistance and halve the current. Will tubes work with only half their normal current?" Before he answered Mac pulled his slide rule from its battered leather case. "I said the cold resistance was around 100 ohms," he said. "According to the slipstick here, if 117 volts are to send the rated 150 mils through the tube filaments, their total hot resistance must be about - hm-m-m-m ­ about 780 ohms. That means that while our resistor will hold the cold-resistance current down to about half of the value passed without the resistor, the actual operating current will be about 87% of the normal figure, which is plenty to make the set perform satisfactorily." "Where do you cut this resistor into the tube line?" "I like to put it between the rectifier filament and that of the output tube. This point is ordinarily easy to reach; it allows the resistor to be mounted away from the oscillator and i.f. coils where its heat might cause trouble; and at this point it will not cause hum by lifting a sensitive filament, such as that of the second detector, above ground. I always mount the resistor above the chassis so its heat will do no harm. The leads, covered with thick-walled spaghetti, go down through a couple of 3/16" holes drilled in the chassis." "Well, you have told me how to make tubes last longer and how to do a good job of substituting when that becomes necessary; but now if you can tell me how we can get more tubes, I'll say you are a real genius," Barney challenged. "All I can do is tell you what I am doing along that line," Mac said with a chuckle. "I am concentrating all of my ordering on one large and well-established jobber instead of shopping around for bargains as I did when tubes were plentiful. Since we are a small outfit, the only way we can make like a good customer is to concentrate all our buying in one place. I know from experience in World War II that a jobber appreciates a technician's depending upon him for all his needs; and he shows this appreciation by doing his best to take care of that technician in connection with the hard-to-get items." "You got any fiendishly-clever schemes for making other items than tubes go further?" "Yep, lots of 'em. For one thing, we are starting re-coning all speakers that can be re-coned instead of replacing the whole speaker as we have been doing. In the past, especially in the case of small speakers, it was actually cheaper in many cases to make the replacement because of the low price on speakers. Now, however, the cut in the use of cobalt is going to make a deep cut in speaker production. New speakers should be saved for those jobs where no repair is possible. And don't throwaway any speaker that cannot be re-coned now. If things get tougher, a lot of things that are impractical now will become very practical." "How's about such things as r.f. and i.f. coils, power transformers, speaker fields, deflection yokes, and focus coils?" "The technicians who were in business during the last war and during the depression know darned well that many of these coil-type parts can be repaired if a fellow will just take the time and trouble to do it. By far the great majority of the breaks in the windings occur near the ends where they can be easily mended. The trick, of course, is to find where the wire is broken. If the coil is entirely open, our stunt of placing a high-voltage neon transformer across the ends of the coil and watching for the arc works one hundred per-cent. If the break is only partial and results in a high resistance in the winding, it can usually be made complete by passing a heavy current through it from a tapped transformer such as is used with an electric train or a tube checker. After the coil is open, the neon transformer can then be used to spot the location of the fault." "Three hundred ohm twin-lead is rapidly becoming a collector's item. What are you going to do about that?" "Shame on you, a ham, for asking a question like that!" Mac exclaimed. "Hams were building and using open-wire lines long before they heard of twin-lead. If the worse comes to the worse, the technician will simply have to obtain some copper wire by unwinding an old coil or transformer, boil some dowel-rod in paraffin for spacing material, and build open lines. He may have to use a 600-ohm line and employ impedance matching transformers at the receiver and the antenna, and the open line may not look so neat as twin lead, but I am willing to bet it will work just as well - at least in rainy weather! At any rate, he is not going to allow a good TV set and a good antenna both to stand idle simply because he does not have a manufactured product to tie the two together. "And along that same line, I have been talking with Bill Garr who runs that motor-rewinding shop on Fifth Street, and he feels certain he can take care of just about any troubles that show up in the antenna-rotating-motors. I figure some of these have been up just about long enough to start needing a little overhauling, and I want to be prepared to handle this situation when it develops." "By golly," Barney exclaimed, "when I was in school I read one time that the only thing we learn from history was that we learn nothing from history, but that certainly does not apply to a technician. Here you are looking away ahead to servicing troubles that are bound to come during this emergency, and, at the same time, looking backward to your experiences during the depression and during World War II for help in meeting those problems. A crystal ball ought to be standard equipment on every service bench!" "If the situation gets much rougher I may consider adding that little item. Come to think of it, housed in a matching cabinet it might not look too bad," mused Mac.